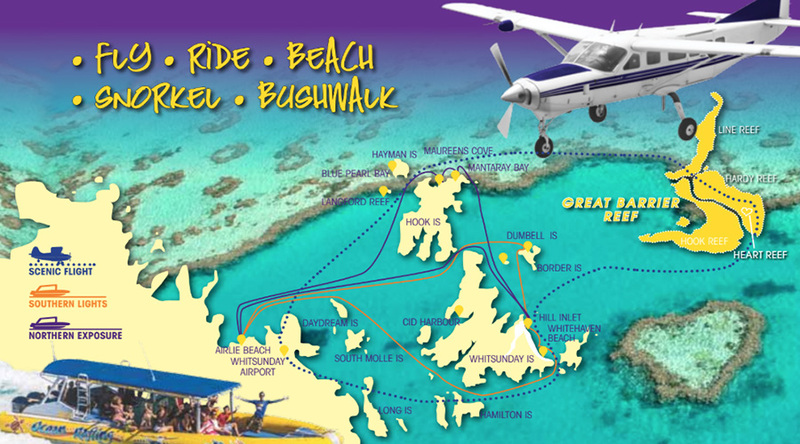 Enjoy the best of the Whitsunday Islands and Great Barrier Reef from above! A truly unique experience! See Heart Reef from above! Make the most of your time in the Whitsundays by joining Ocean Rafting for a unique and memorable flight-seeing experience. See the Whitsundays from above with a stunning Whitsunday scenic flight over the islands and Great Barrier Reef, including famous Heart Reef and Whitehaven Beach! All passengers will have a window seat, so you'll be able to marvel over panoramic views for the entire duration of the flight! Your local pilot will also be providing informative in-flight commentary, pointing out particular islands, sites, reefs and marine life. Chance to spot marine life! Couple the 60 minute scenic flight with a day cruise on Ocean Rafting for the ultimate Whitsundays experience! *Note: You MUST include your body weights and pick up location when booking this tour. All inclusive tour. Optional upgrade to "Fly & Raft" package available - ask us for more details! Minimum numbers of four passengers for flights/flight packages apply. Ocean Rafting may use photographs of our clients in promotional material, including but not limited to social media, however if you do not consent please advise Ocean Rafting. For legal and safety reasons all passengers are weighed prior to boarding. Individual weights in excess of 110kg will incur an extra seat surcharge. Combined body weights per two passenger bookings in excess of 180 kgs will incur an extra seat surcharge. Maximum per seat weight is 130 kgs. All flights are operated at the discretion of Ocean Rafting, and are subject to weather conditions, air traffic control and other influences outside of our control. All departures and itineraries are subject to weather. Tours may be changed or cancelled for any reason at the discretion of the Tour Operator. It should be noted that adventure travel involves risk. Whilst we make every effort to safeguard clients, we cannot be responsible for personal injury or loss due to actions of our clients which are beyond our control. We recommend that all clients have travel insurance covering illness, injury, loss or damage to personal belongings and not being able to travel on the confirmed date of departure. Please be aware operators pass on credit card merchant fees so there is a non-refundable 2.5% surcharge for VISA and MASTERCARD card purchases. All client cancellations forfeit 25% of total ticket price and all client cancellations made less than 7 days prior to departure will result in complete forfeiture of the full price of the scenic flight. If the aviation company has to cancel the trip (prior to the flight departure) and we cannot offer a suitable alternative, then a refund will be given, minus card fees. We strongly recommend that you have travel insurance especially during the wet season. Thank you for booking with Sailing Whitsundays/Mr Travel. If you need any advice or assistance making arrangements for your accommodation or transfers please do not hesitate to ask.